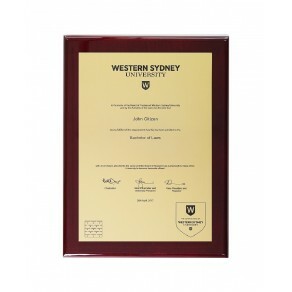 For current WESTERN SYDNEY UNIVERSITY PLAQUE options CLICK HERE. 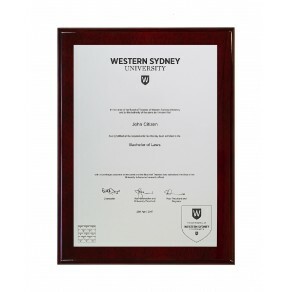 We offer a range of plaques for any certificates, either mounted on timber acrylic or even framed. Order from our range below, check out our gallery for more ideas or contact us for more information. A4 Coloured, Silver on Black ..
A4 Engraved, Acrylic on Rosewood ..
A4 Engraved, Gold on Black ..
A4 Engraved, Gold on Rosewood ..
A4 Engraved, Silver on Black ..
A4 Engraved, Silver on Clear Acrylic ..
A4 Engraved, Silver on Rosewood ..